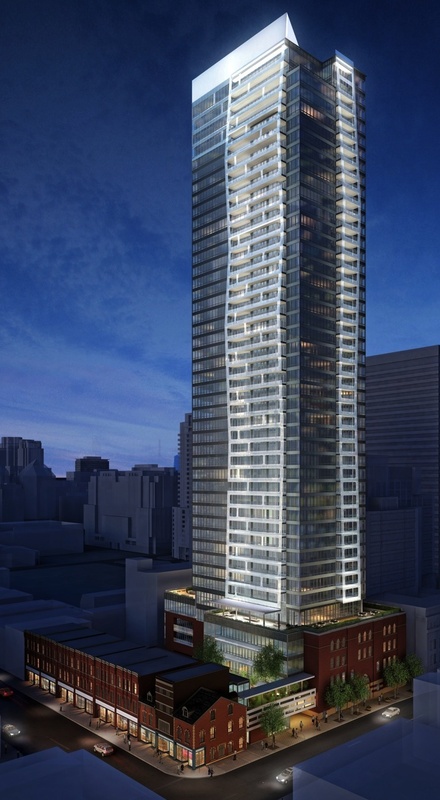 5 St. Joseph – Bousfields Inc.
Bousfields was engaged by Diamond Corp, and subsequently Mod Developments Inc. and Greywood Developments Ltd., to obtain approval for a 48-storey building on a site in the northwest quadrant of Yonge and Wellesley. The project preserved the site’s various heritage elements and included the refurbishment of the adjacent cobblestone lane, the retention of surrounding warehouse buildings and the repurposing of existing units along Yonge Street. The project’s sensitivity to heritage preservation has been a model for other redevelopments on this section of Yonge Street. Bousfields was responsible for preparing the Planning Rationale, as well as the project management related to obtaining the necessary development approvals. The project is currently under construction. Client: DiamondCorp, Graywood, MOD Developments Inc.